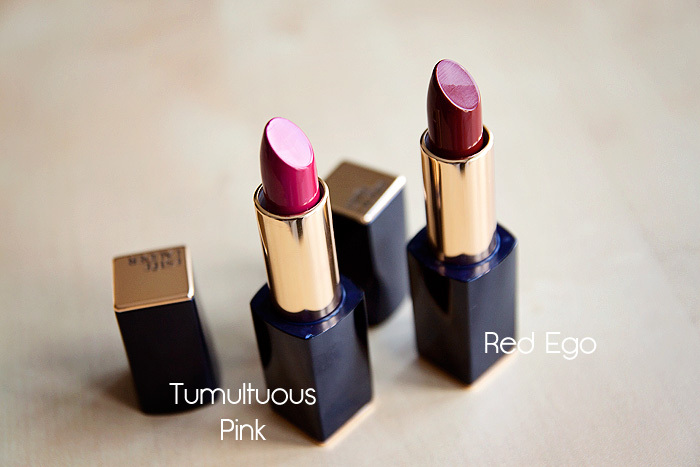 February must be formula month, because I’m going gaga over some perfectly-created lipsticks. Don’t get me wrong… I’m a sucker for some pretty packaging too and can be driven equally wild by a product based purely on it being the perfect shade but the perfect formula? Well, like I said, it must be a month for it because not only did Clarins blow me away with their sheer (gerrit?) perfection earlir this month, it’s now Estee Lauder’s turn to get me all of a flutter with some incredibly-formulated, deeply-pigmented lip colours. The new Estee Lauder Pure Color Envy Sculpting Lipsticks – launched just this month – feature a range of 20-shades that should particularly excite my fellow bold lip fans. The collection promises to deliver saturated colour and continuous moisturisation with a formula that stays true for up to 6-hours. Formulated with a new and exclusive Time Release Encapsulated Moisture Complex with Hyaluronic Acid, I’ve been rather impressed with the happy medium the brand have managed to capture between long-wear and comfort. 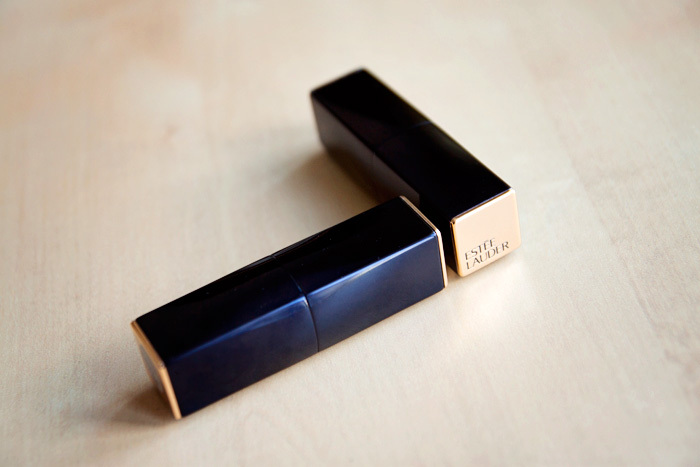 First of all, the packaging is a bit of a departure from Estee Lauder’s classic heavy gold styling… these lipsticks are dressed in navy with gold accents. The heavy-weight feel is still there but it’s a little more understated in design with that incredibly addictive magnetic closure that feels so satisfying to use. Application is easy straight from the bullet but as with most bold shades, I prefer to tidy up the edges with a lip brush and the formula of these offers enough slip that I can achieve this easily with just a little extra product applied near the lip-line. Talking of the formula, although creamy… it feels very light-weight for the amount of pigment it provides. Infact, I almost want to describe them as being more like a rich gel formula, either way… you know when something just feels technologically advanced? It’s like wearing an old skool Rouge Volupte without any of the weight or inconvenience of migration/feathering. The swatches above show two swipes taken directly from the bullet, you can see the shine and the depth of pigment that the two shades – Tumultuous Pink and Red Ego – provide. Upon fading, they leave a stain which makes them perfect for blotting if you’re not keen on a high-shine lipstick. I tend to blot Red Ego once but leave Tumultuous Pink just as it applies, it’s a personal preference. 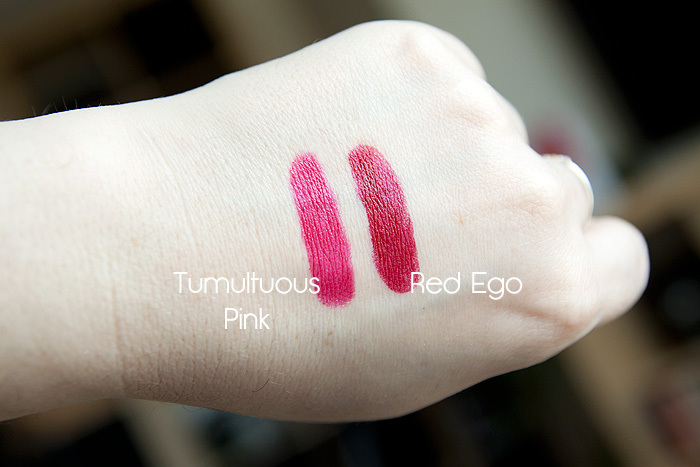 I’ve included shots below of both lipsticks worn on the lips, the pink leans a little more fuchsia on my lips than I expected from the bullet and the hand-swatch but I’d imagine that this may not be quite so apparent on a warmer skintone. From the shade range on offer, Dominant looks to be a bluer-pink (or possibly just a little lighter) than Tumultuous Pink. 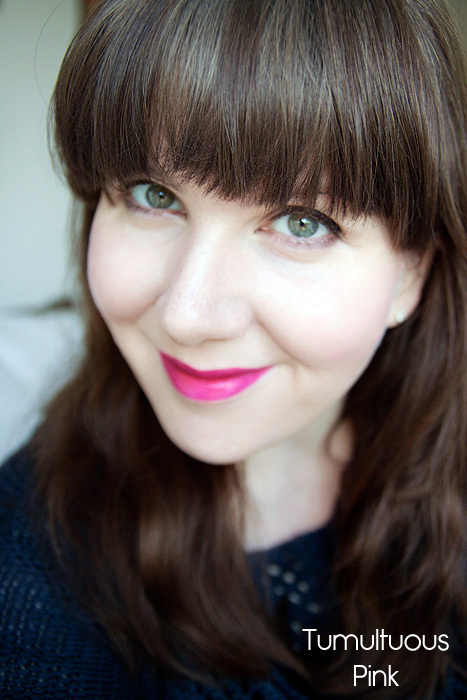 Definitely worth swatching on counter first though to get your perfect pink match! Red Ego is simply a dream. Shade-wise, it’s my perfect red… rich and dark with just enough of a berry hint to complement a cooler skin-tone. 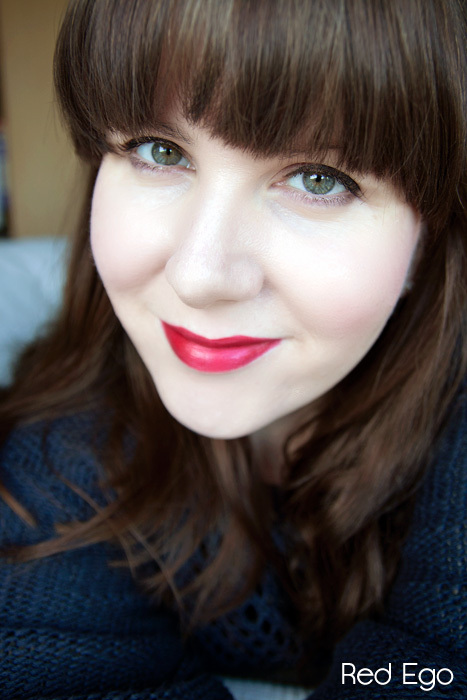 It looks darker in the bullet than it does on the lips, especially when blotted, but it still retains the kind of richness that your standard pillar-box red just can’t deliver. The Estee Lauder Pure Color Envy Sculpting Lipsticks are available to purchase on counter and online from esteelauder.co.uk now, in a range of 20-shades (+ one online exclusive), priced at £24.00 each. Both look great but Red Ego is just stunning. Unfairly I always think of Estee Lauder as a “granny” brand and never look at it but I definitely need to have a proper perusal. Jimmy Choo FLASH, launches nationwide today. Red Lipped Readers - Part Seven! The best free (or cheap) delivery offers around!